Mack Sennett Studios, Eastside Los Angeles‘ premier production studio and event space, celebrates the unveiling of famed American activist and street artist Shepard Fairey’s latest work, a collaborative mural entitled American Dreamers. The 60 x 30ft mural marks the second collaboration between Fairey and Portuguese street artist Vhils (Alex Farto), whose solo show Annihilation was on view February 22 – April 1 at Over the Influence gallery in Downtown Los Angeles. The center of the American Dreamers mural, which was completed in less than a week, features Fairey’s iconic Target Expectations image, addressing the challenges of becoming a resident of, and now just visiting, the United States. The chiseled textures and portraits with women of different ages were added by Vhils to symbolize the multi-generational nature of the struggles of immigrants. 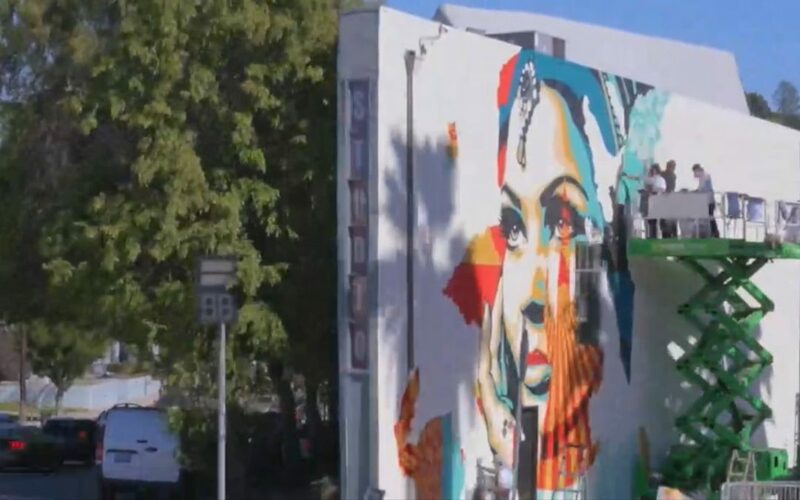 Fairey and Vhils shared the same sentiment that “refugees and people who would expand diversity seem altogether unwelcome in the U.S. at the moment.” The pair first collaborated last year on a large mural in Lisbon, featuring the face of a woman from Fairey’s iconic Universal Personhood series. The Mack Sennett Studios is located at 1215 Bates Ave., L.A., CA 90029 and the American Dreamers mural is on the corner of Bates and Fountain. For more information on Shepard Fairey click here.